The Western tradition relies on a balance between fulfilling the ego and allowing the soul freedom to speak. But, with modernity, the old certainties that guided human life have faded. A crisis of meaning has followed. 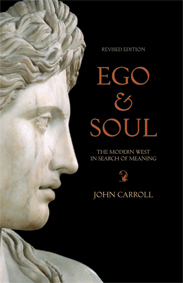 In this substantially revised edition of Ego and Soul, John Carroll examines the battlegrounds across which a struggle for meaning is being fought — including work, sport, intimacy, the university, shopping, tourism, computers, democracy, and a retreat into nature. On the one side, depressive pessimism, rancour, and disenchantment have arisen, accompanied by rampant consumerism. The upper-middle-class elites, with their high culture, have lost their way. On the other side, much of what people still do disguises a search for meaning. Groping unconsciously for direction, inhabitants of the modern West are even, in their ordinary and everyday lives, casting lines into the transcendent in the hope of a catch. And there is success. Ego and Soul offers a surprising and compelling new look at the way we live today, and the way we try to make sense of our lives.